Joan was born to Florence and Albert Duke on 8th August 1922 in Camberwell. She was the fourth of five children – Len, Ted, Patrick, then Joan and Gwen. Sadly, Joan was the last surviving sibling. The family were brought up in Camberwell at first and then later moved to Tottenham. Albert was a milkman with a traditional horse and cart. As a young girl, Joan was a great reader and would even read while walking down the street. She was very good at sports too, especially running and jumping, and she was the school champion high jumper. Joan didn’t have a healthy childhood. She suffered from rheumatic fever which affected her heart and she missed a lot of schooling. However, she was highly intelligent and she achieved much in her life. Joan left school at 14. She first worked in a chocolate factory, but she hated it there and moved to a factory where they made parts such as valves for radios. She did extremely well there and was asked to test radio components for use in the war. When Joan was 19, she lost her brother Patrick after his ship was torpedoed, and her father Albert also died in the same year. This was a hard time for Joan. She lost her faith for a while but it came back. Joan met her husband-to-be Sergiej (Sergey), always known as Michael, we think at the Astoria Dance Hall. Michael had had to move to this country from Belarus. They were married on Christmas Day in 1951, which was also Michael’s birthday. It was very brave to marry a foreigner in those days but Michael and Joan were devoted to each other. They had a very long, loving and strong marriage and Joan lovingly cared for Michael throughout his Alzheimers. They firstly lived with Joan’s mother, Florence, in Tottenham. Their daughter Maryia was born to them in 1953 and, when she was two, they moved to their own house, also in Tottenham. Joan went to night school to learn bookkeeping and she successfully qualified to work as a bookkeeper. When Maryia was 9, they moved to Waltham Abbey. Joan walked around all the businesses there asking for a job and she got one in a furniture factory. She carried on working there until she was 63 – a much valued and loyal employee. Up until 2006, Michael and Joan had continued to live in Waltham Abbey but then they needed to be closer to Maryia and Keith in Sidcup. They selflessly agreed to sell up their house and started to look for a flat in Sidcup. After a while, they found a flat in Finch Court which they really liked. Michael and Joan got to know the folks at Finch Court. They made some very good friends there and they both felt very safe and secure. Sadly, Michael died on November 26th 2009 – a very hard time for Joan. 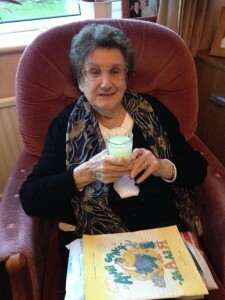 She stayed at Finch Court where she still felt secure on her own and she has done very well. Joan continued to be very independent and did everything for herself. She was still cooking proper meals when she was 95! At home, Joan continued to love her reading. She followed politics and kept up to date with current affairs. She was an excellent dressmaker and made coats and dresses for Maryia when she was young. Joan was a very good cook. She embraced Michael’s culture from Belarus and made his traditional dishes. Joan was a very intellectual woman. She was very kind and caring and had time for everyone. Joan lived her wonderful life very wisely and stoically. She was such a good example of how to live life to the full in such a positive way. Joan wasn’t afraid of dying and she fully believed that she would be reunited with Michael and with all of her family. Just a few memories of a very special lady who will be much missed. This entry was posted in ABS and tagged Joan Dzejka. Bookmark the permalink.